Back in May 2007, Megan Gaiser, the President of Her Interactive, called me with a view to coming up with a design strategy to launch Nancy Drew on a number of new platforms – including the casual games arena and the Nintendo DS. Megan and I worked closely together to breakdown the elements of a successful Nancy Drew PC game and see how we could translate that success to different formats. Our main priority was to take the things that the Nancy Drew fans loved about the ‘full-size’ PC adventures and to translate them into a unique new form of casual game that was easy to play but was full of rich story, characters and mystery! By building from the core expertise of the Her Interactive team – definitely the world experts in the ways of Nancy Drew! – we knew that we could come up with something that was new – dare to play Nancy Drew in a new way! What we didn’t want to do was end up with an unsatisfying cut-down version of a full-blown PC adventure, nor did we want to make something as simple as a basic ‘I-Spy’ game – for us, the clues and the mystery had to be story and character driven, and more importantly the puzzles and gameplay had to make sense within the context of the adventure and be tangible and consistent with the setting. Megan had put together the core of a great team for ‘casual’, with Mari leading production, Tim and Ayu defining the art style and Mike developing the design. As we started to work together to discover what this game was all about, we slowly learned what was feasible and what was POSSIBLE for a casual game like this. I of course learned more slowly than most and kept delivering mounds of information – enough for 3 or 4 games! Luckily the team were pragmatic and practical about what we could achieve, and the quality of “Nancy Drew Dossier: Lights, Camera, Curses!” is all down to them. I felt proud that I had helped to kick-start the process and end up with such a successful (and beautiful!) game. Over the course of the project I used all sorts of techniques to explore and develop design ideas based on the criteria we had set for ourselves. 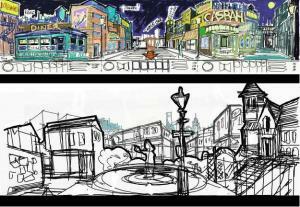 Concept ArtThis is the first concept I drew for panoramic ‘action’ screens with parallax depth. The idea was that this translated into the nine ‘screens’ you see above, layered on top of each other. Ayu from the art team stitched together my sketches and color-coded the parallax layers. With the help of the HI marketing department, we were able to come up with a number of stories that would fit the game demographic, and the idea of using a movie set emerged a clear favorite. Concept ArtThe first scene in the game we started to look at was the ‘film Noir’ setting. Living in San Francisco, I was inspired by the local setting for The Maltese Falcon, and we started writing in elements of hard-boiled detective stories, Bogie and the ‘Noir’ experience, and of course creepy Victorian mansions! The beautiful finished image from the art team then provided a great backdrop to do quick sketch designs over for individual puzzles. Here are more set up sketches I did for the Egypt scenes in the game, and the bottom image shows my scruffy image drawn properly by the Art team! 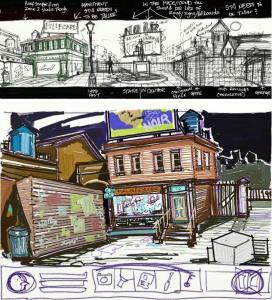 The second image was a rough for the Egypt movie set that wasn’t used. It was a great pleasure for me to work with this talented team, and my ten-year-old daughter Charlotte gave the finished game her seal of approval! Moving on, we took a similar approach to developing a new franchise on the Nintendo DS, and with brilliant producer Alena Saunders we are just putting the final touches on a brand new mystery game we hope will launch soon! wow cool. my first throught was, phil campbell ye olde adventure columnist from c+vg etc so cool... then I thought, probably a different Phil. some really cool info in there Matt, if this is any indiction the rest of the GDC content, things are going to be stellar. Yeah, Phil was just great. Yeah, Phil was just great. He's one of those guys that has so many ideas that you could walk away after a 10-minute conversation and have ideas for 10 different games. He's also a huge Doctor Who fan! It was hard to "stick to business" when we had so many fun things we wanted to talk to with him. He cracked me up with his one-liners about Lara Croft. This guy really ought to be on TV. Yep, Phil was one of the great ones. I suspect we'll be using quite a few sound bites from him in the feature film. That was an exceptional scoop, Matt! That Phil Campbell was gracious enough to provide us with such fascinating, behind-the-scenes details was not only extremely generous on his part, it also speaks well of the love and artistry "Her Interactive" puts into their games. The article above made me seek out more information on "Lights! Camera! Curses!" on the Her Interactive web site, and to my surprise, I discovered an online playable demo of this game. I played it, and found myself hooked until I reached the end of the demo! This is the first "pair matching" casual game that I actually enjoyed, and they really managed to make "pair matching" a logical engine for storytelling and adventure. I guess I never associated the "adventure" genre with "pair matching" before, but this game opened my eyes to the thought that "adventure" games are in essentially pair matching games. I guess I had to be dragged kicking and screaming to these new adventure games, but it really works here, and I am quite excited at the discovery of this game. How will you guys top this scoop? And thank you, Mr. Campbell, for your informative essay!